Clean spills on your carpet or upholstery immediately to prevent hard to remove stains. Use cold water on spills when rinsing unless told otherwise. Blot the stain – do not scrub or rub! Soak up excess water with a clean white towel or paper towel. Do NOT use any products containing BLEACH. Several supermarket stain removers have bleach in them. Keep the area damp until ChemDry can get there to remove the stain if you cannot remove the spill or stain yourself. You can do this by lightly wetting the stain and putting a towel, kept damp, over the top of the stain. Spills that are left to dry and left for a long time will become harder to remove. 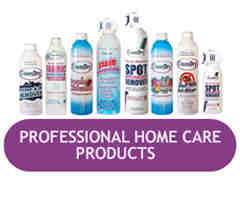 Book ChemDry to come and remove any stains on your carpet or upholstery if you are not sure how to remove it yourself. Get professional help from your ChemDry technician if ugly residues are left after you have tried to remove stains in your carpet yourself. Read directions for use first when using ‘ChemDry Spot Remover’ ‘ChemDry Grease & Oil Remover’ and ‘Pet Odour Remover’. Note: ‘Cleaning Solution’ can be mixed with roughly 1 teaspoon of detergent to 1 litre of water. Different types of stains in your carpets may need different cleaning processed to be removed safely and without leaving ugly residue. Blood Blot as much blood up as you can. Lightly wet the spot again and continue to blot it up, remembering not to rub! It could take several goes. Use cold water only! (Blood often re-appears after drying.) Blood is hard to remove. Blood ‘wells’ under the carpet and often comes back after drying. Book ChemDry. Use ChemDry’s ‘Spot Remover’. Beer Blot up as much beer as you can, then rinse with the ‘Cleaning Solution’ and blot again. Easy to remove. Use ChemDry’s ‘Spot Remover’. Chocolate Scrape up excess chocolate. Blot with Rubbing Alcohol. Rinse with ‘Cleaning Solution’ and blot up. Easy to remove. Use ChemDry’s ‘Spot Remover’. Crayon Very hard to remove crayon yourself. Try blotting with Rubbing Alcohol. Rinse with ‘Cleaning Solution’ and blot up. The longer it stays there the harder to get out. Hard to remove. Book ChemDry to come and clean ASAP if stain remains. Book ChemDry to clean. Coffee Blot the coffee stain first to get as much out as possible. Best to use ChemDry’s ‘Spot Remover’. Otherwise rinse with the Cleaning Solution’ and blot up. Repeat. If it doesn’t work, book ChemDry. The stain will be harder to remover over time. Use ChemDry’s ‘Spot Remover’. Cordial Blot up excess cordial first then use ChemDry’s ‘Spot Remover’. Otherwise, rinse with cold water and blot up ASAP. Often hard to remove so book ChemDry if you can’t get it clean. Use ChemDry’s ‘Spot Remover’. Dyes Book ChemDry ASAP. The longer the stain stays the harder it is to remove. Hard to remove. Book ChemDry to clean ASAP. Book ChemDry to clean ASAP. Grease or Oil Use ChemDry’s ‘Grease & Oil Remover’. Otherwise, apply a small amount of Rubbing Alcohol to a white cloth or paper towel. Blot the rubbing alcohol onto the stain. Once gone, rinse with ChemDry’s ‘Cleaning Solution’. Easier to remove if using ChemDry’s “Grease and Oil Remover”. If stain returns or there is a residue left, book ChemDry to clean. Ink It is very hard to remove ink from carpet and upholstery. 9 out of 10 people make the ink stain worse because it spreads very quickly. 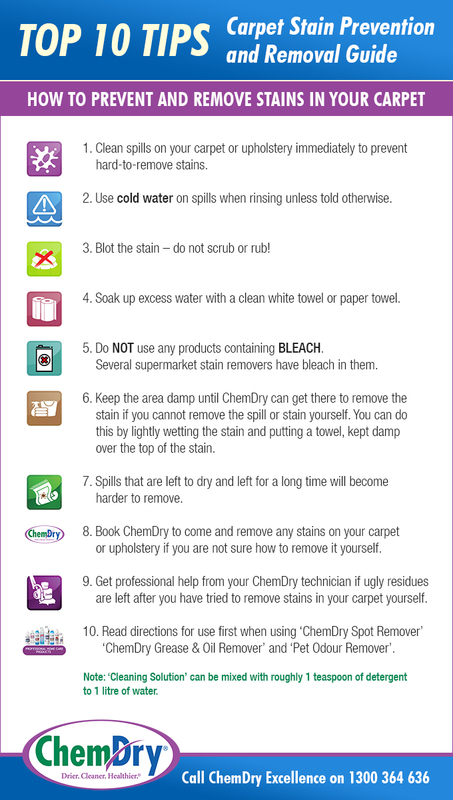 Keep the stain damp and call ChemDry ASAP to clean. Ink is very hard to remove. Book ChemDry. Book ChemDry to remove ink stains. Lipstick / Makeup Use ChemDry’s ‘Grease & Oil Remover’ to remove lipstick and makeup. Once gone, rinse with ChemDry’s ‘Cleaning Solution’. Lipstick & makeup are very hard to remove. Book ChemDry if unsure. Use ChemDry’s “Grease and Oil Remover”. Nail Polish Use Nail Polish Remover and rinse out with ‘Cleaning Solution’. Repeat if necessary. Very hard to remove. Book ChemDry if unsure. Book ChemDry to clean. Red Wine Blot up as much red wine as possible then use ChemDry’s ‘Spot Remover’. Otherwise, mix 1 tablespoon of dish washing liquid, 1 tablespoon of white vinegar (WHITE vinegar only), and 2 cups of warm water. Soak a clean rag with the mixture and dab onto stain. Blot off with a dry clean rag. Alternate between the two. Then pour some cold water onto the stain and blot up with a 3rd rag. red wine can be difficult to remove. If the stain is still visible book ChemDry to clean ASAP. Use ChemDry’s “Spot Remover”. Soft Drink First, blot up as much of the soft drink as you can. Then use Chemdry’s ‘Spot Remover’. Otherwise, rinse with the ‘Cleaning Solution’ and blot up. Then rinse with a vinegar solution (1 part vinegar to 2 parts water) and blot up. Repeat both steps until gone. Can be difficult. If stain is still visible book ChemDry to clean asap. Use ChemDry’s “Spot Remover”. Tea Blot up as much of the tea as you can. Use ChemDry’s ‘Spot Remover’. Otherwise, mix 1 tablespoon of dish washing liquid, 1 tablespoon of white vinegar (WHITE vinegar only), and 2 cups of warm water. Soak a clean rag with mixture and dab onto stain. Blot of with a dry, clean rag. Alternate between the two. Then pour some cold water onto the stain and blot up with a 3rd rag. If stain is still visible, book ChemDry to clean ASAP. Use ChemDry’s “Spot Remover”. Pet Urine Pet urine is very difficult to remove, so blot as much up as possible. Use ChemDry’s ‘Pet Odour Remover’. It is best to get ChemDry to come and clean it properly because if the urine has dried then it leaves urine crystals under the underlay and you will get bad odours. Urine also has acid in it and can burn the carpet, discolouring it. Very hard to remove without ChemDry’s ‘Pet Odour Remover’. Book ChemDry to clean. Use ChemDry’s ‘Pet Odour Remover’. Otherwise, book ChemDry to clean. Vomit Vomit can be hard to clean, depending on what was eaten or drunk. Clean as much up first, then clean with Chemdry’s ‘Spot Remover’. Otherwise, rinse with the ‘Cleaning Solution’ and blot up. Can be easy or difficult depending what was in the vomit. Book ChemDry to clean if still visible. Use ChemDry’s “Spot Remover”. It is always best to book ChemDry Excellence to help you remove accidental stains. We take ‘No Liability’ if things are not done correctly and damage is done to your carpet by your own attempts to remove stains. The above examples will not damage your carpet if done correctly.